"Timlin worked on The Ship that Sailed to Mars for two years. It was started as a diversion for his son in 1921. 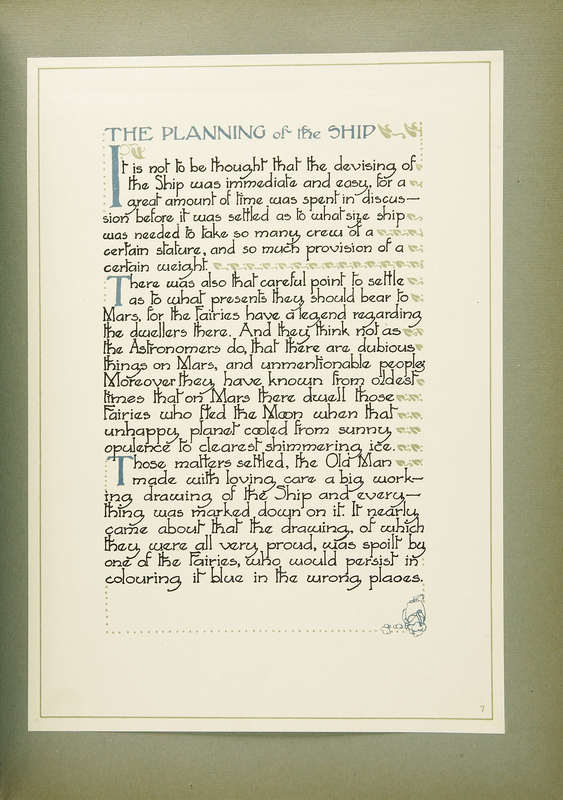 The work expanded until in its final form it had 48 pages of text and 48 colour plates showing remarkable flights of fantasy. 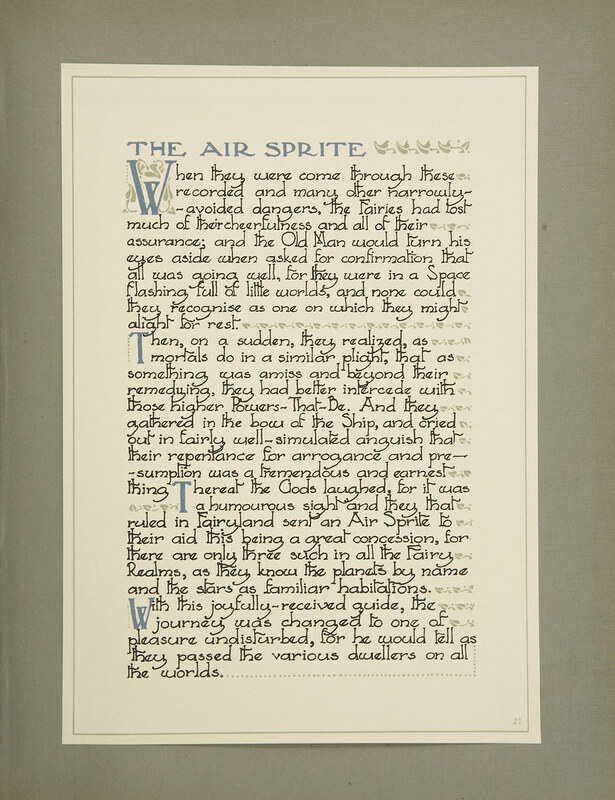 Timlin sent the book to publishers George Harrap, who were delighted with the illustrations and the calligraphic text, deciding to print it without typesetting. 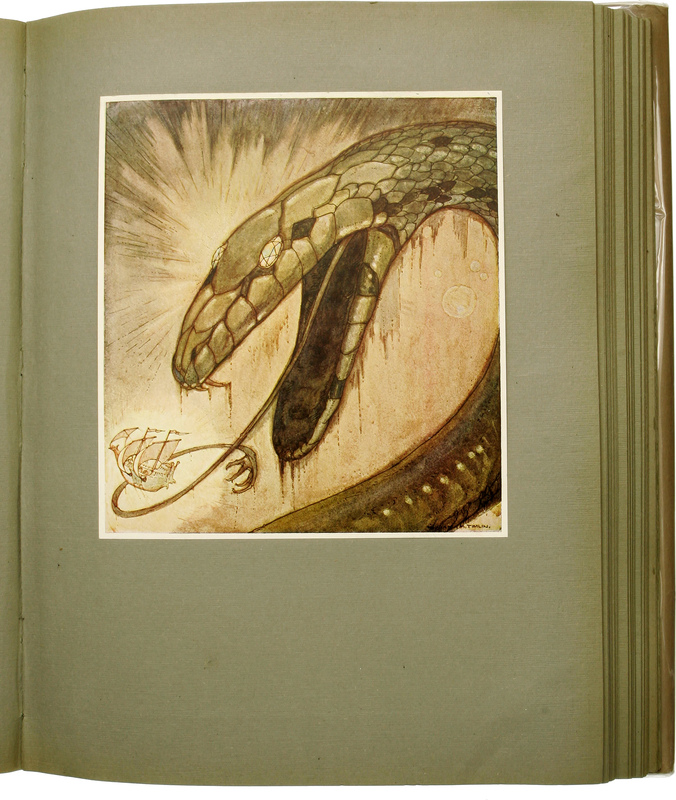 The book has since become a fantasy classic. 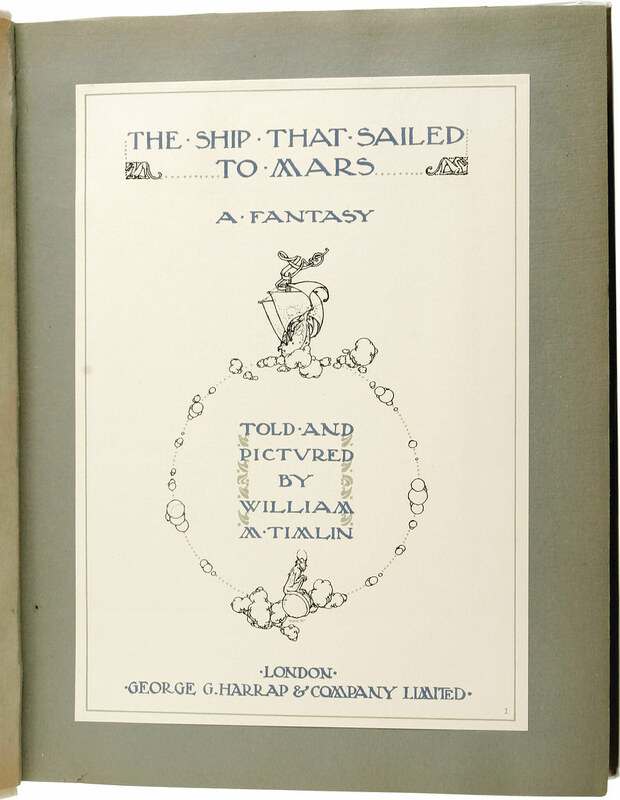 The film rights to the book were purchased in the United States, where Timlin enjoyed great popularity. Alan Horne in The Dictionary of 20th Century British Book Illustrators describes the book as a masterpiece and 'the most original and beautiful children's book of the 1920s'." - quote source from Timlin's Wikipedia page. 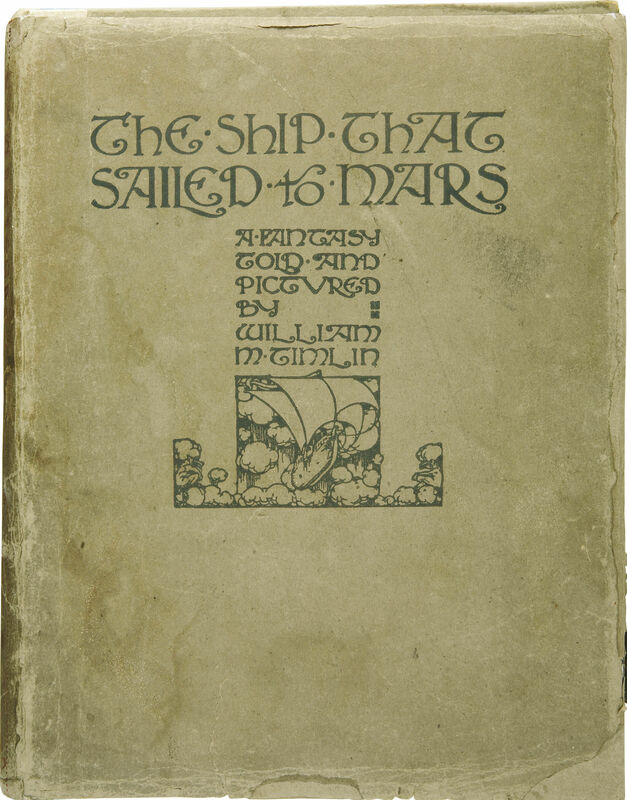 The entirety of William Timlin's "The Ship That Sailed To Mars" can be read here. 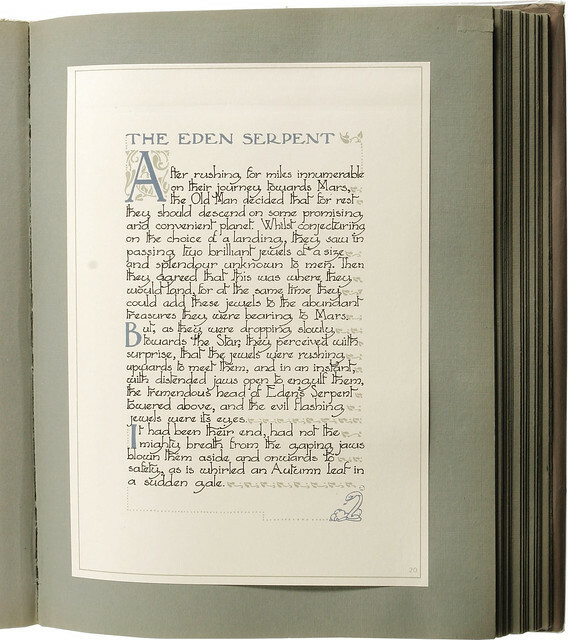 You can find the first edition for prices ranging from 2,500 - 15,000 dollars. The newest edition coming out this fall is at a more reasonable price. For milestones they had stars thousands of miles apart, and sometimes, when passing over a lonely desolate planet, they would see its primeval slime stir and heave, as some unnameable monster turned its remembering and weary eyes, following the radiant flight of the Ship. Or others would stretch their towering lengths and bellow uncouth blasphemies across the void. 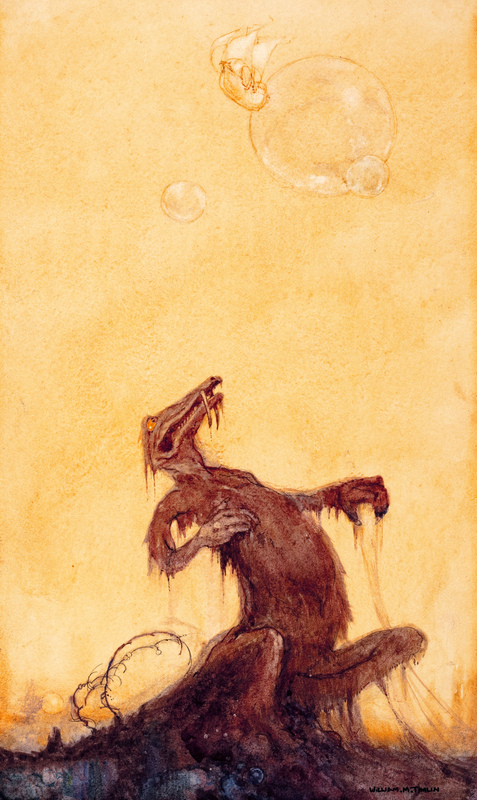 Once the fiery breath of that One whose Name is shuddered at on Earth, and whispered to-and-fro on dark and windy nights, nearly engulfed the Ship, and shrivelled it in the cascading flames that ascended from its myriad eyes and mouths. His horrible spouse, that evil that had troubled men through all the fabled days, wallowed at his side, and adding her voice to his, shrieked in maniac rage at her hatred of mankind. On their arrival at Mars, following their flight from the Moon, they found the land fair and free of Man or Fairy, but roaming its woods were harmless but inexpressibly Hideous Things. 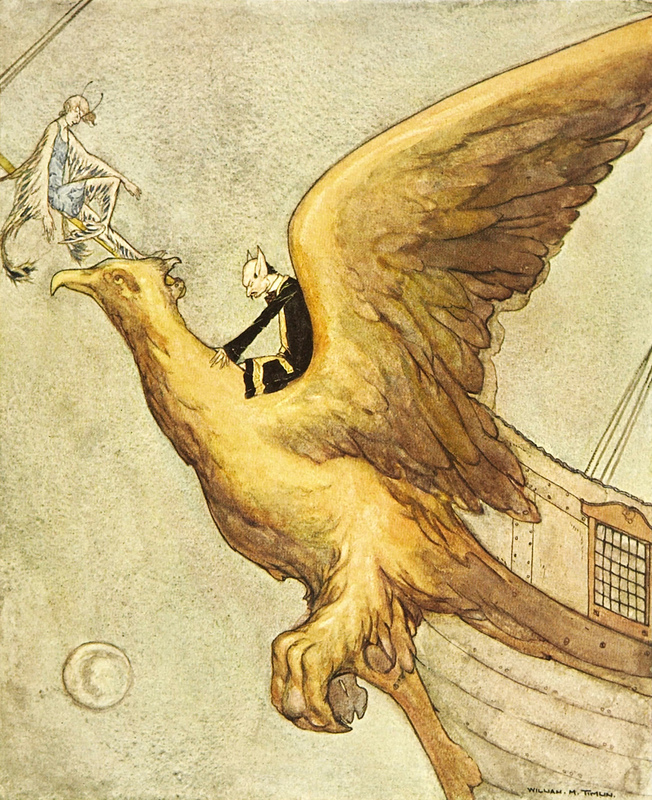 Many were like unto the evil thoughts of a maniac at moonrise; others were sluggish, amiable beasts, and then there were those Monsters that flew. Then, as it was rather trying to the feelings of even Fairies to step into a dell and find a towering monstrosity dosing in that cool retreat; or wake up in the night to see an un-nameable thing with creaking wings, perched upon the couch's end, they organised a Great Hunt, and nearly all these pests were driven in and housed, and caged in a place appointed. 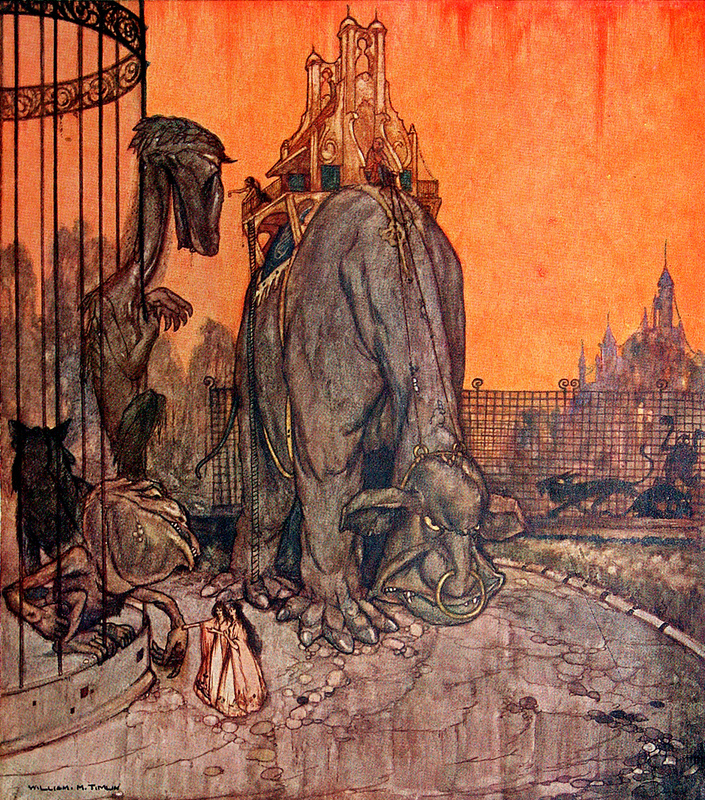 There, amidst a herd of mooncalves, the Old Man saw the Cow, which he had presented to the intensely gratified Princess, and its demeanor was one of complete bovine content and absurd complacence; for ever there came multitudes to see the wonderful and fearsome creature from Earth. 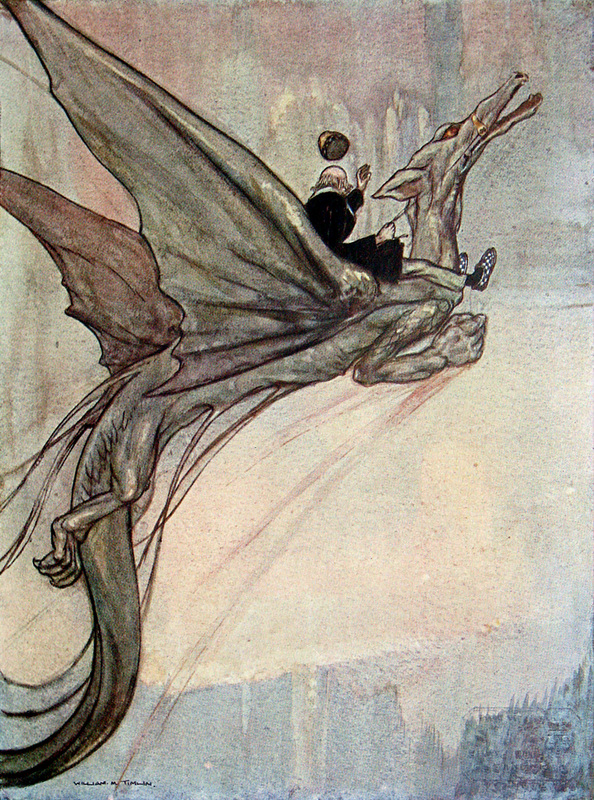 Of late the Princess had often heard from the Old Man of the fearful and unfamiliar storms on Earth, and it was her hope that he might, in his knowledge and experience, clear away the trouble of her own people, a trouble against which Fairy Arts had long been futile, So she begged the old Man to bring his earthly lore to her aid. 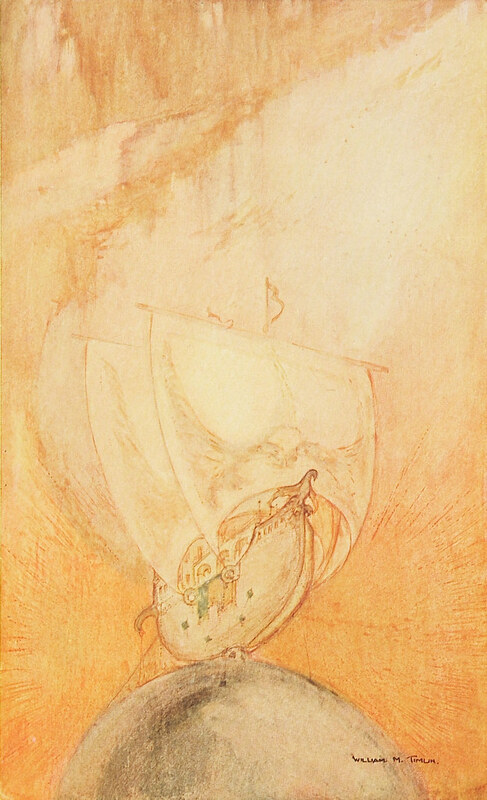 And one morning, while the City slept, he set out on a dragon procured for him, and steered his way over the palaces, past the Temple, and beyond the hills, to where the broken shimmer of many lightnings showed him the course of his journey. 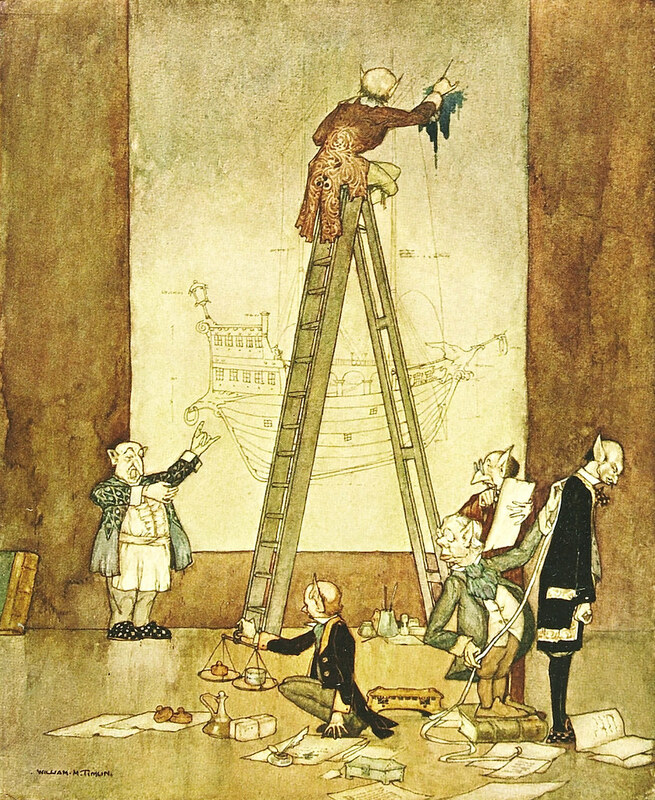 Although the Old Man's Fairies had now left him, to live with more congenial spirits among the King's Barge Builders, he was scarcely aware of their departure, so busy was he exploring the wonders of that City. Everywhere his presence passed unchallenged, and his friendly greetings were smilingly returned. Or an Elf would run out from some low-browed jeweller's shop and press a priceless ruby into his hand; or a Fairy would strip off her necklace of moon-stones for him, and many banquets were given in his honor. Now the Martians have a belief that all was once miraculously created, and to the Creator they have raised a temple on the apex of a hill. Myriad-pinnacled, with daring spans of flying buttress and airy bridge, everywhile they had added to it, till in time it had become an ineffable shrine of gratitude and joy. And it was a place of supreme happiness. 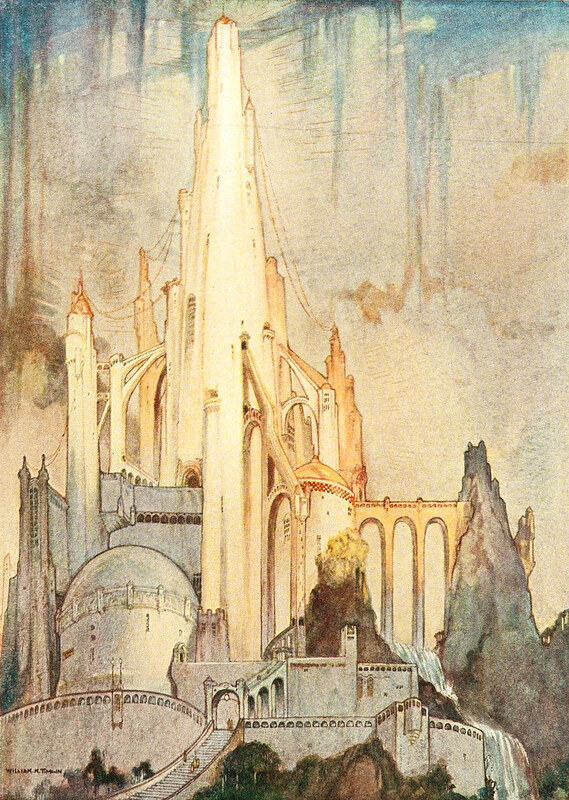 The Old Man spent much of his leisure for many days wandering along its terraces and up and around the great central spire, or viewing the treasures with which the palace overflowed, and sometimes with him went the Princess. As he went, the land unrolled beneath him like a many-patterned carpet, and it was very fair. 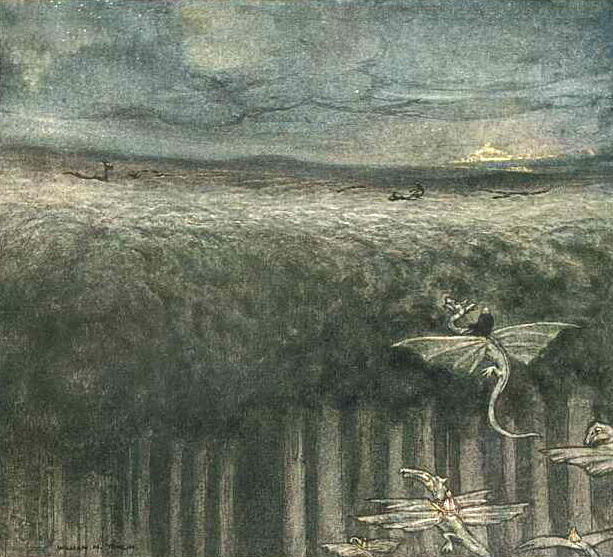 But as he was come close upon his quest's ending, his way was blocked by a forest of such mighty growth that his dragon could not overfly it. 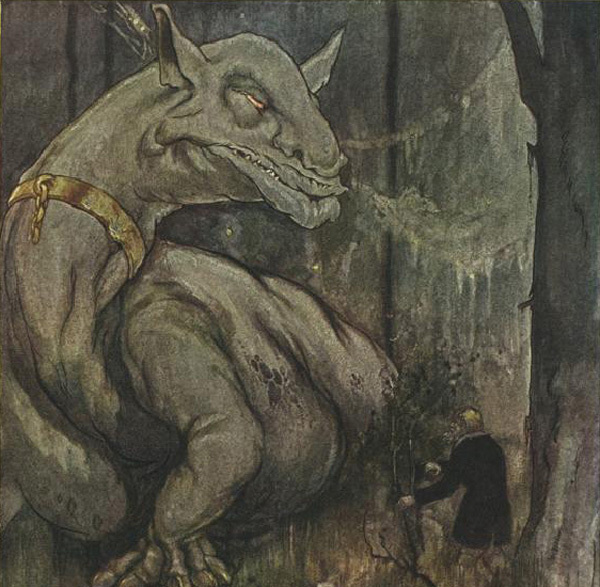 Therefore he descended, and, hitching his beast to a river willow, he entered apprehensively amongst the towering trees, into a pathless gloom. Then suddenly, as he was forcing his way through the heart of the Forest where there was little light, there rose before him a Monster worse than any in all the Zoo of Mars. Its eyes glimmered madly red, and its tongue rasped suggestively amongst its spiky, craggy teeth, and its bloated body heaved. A brooding silence hung round the place, and seemed to peer derisively between the trees. It was indeed a spot where any dreadful thing might easily happen. Around that re-born throng flew the cry, "Let us return!" And one was sent before to carry the news, whilst others mounted, and, bearing the Old Man, rose on beating wings and flew towards home. Nor could the mighty Forest stay them, for they skimmed over its impenetrable top, on which strange things gambolled and played. Forward they went, on the journey they never thought to make. And so they returned at last. And the City softly glowed, canal and palace, radiant tower and jewelled dome, fairy-lit and beautiful with flowers, light, and laughter, for the wanderer's return, and the Old Man from dreary Earth was the most welcome of them all.